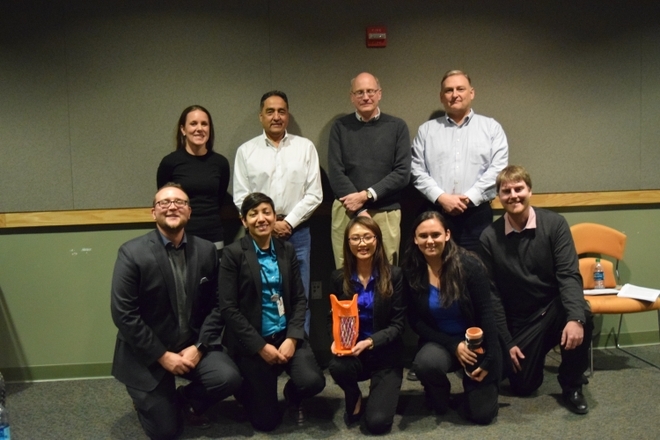 The students submitted a proposal for a continuously adaptable socket that patients could begin wearing immediately post-surgery as part of the 2017 UNM Bio Design Program competition. The competition is part of a joint UNM School of Engineering and Health Sciences Center class led by Christina Salas, PhD, an assistant professor with joint appointments in the UNM Department of Orthopaedics & Rehabilitation and the School of Engineering. “The goal is to investigate real-world clinical problems in an interdisciplinary way in order to develop devices and solutions that fill in gap in the needs of patients,” Salas said. The competition’s theme for 2017 was addressing current barriers in physical medicine and rehabilitation. Salas, along with chemical engineering students Victoria Lujan and Jane Nguyen, mechanical engineering student Evan Hagin and Matthew Rush, a PhD candidate in nanoscience and microsystems engineering, toured the Lovelace UNM Rehabilitation Hospital to investigate how to update prosthetics worn immediately after amputation surgeries. Amputations below the knee are the most common types that surgeons perform, and having an adjustable prosthesis helps patients heal quicker during the first year. The first post-operative prosthesis was introduced in the 1950s, but the team found few physicians prescribe them today because they are bulky and hard to remove, making it difficult to monitor wound healing. The winning design, called the “Limitless Socket,”addresses those issues. The team devised an easily disassembled socket that can help doctors control swelling, is continuously adjustable and easy to remove in order to check a wound. The HSC’s Clinical & Translational Science Center and the School of Engineering each contributed $25,000 for the prize. Competition judges included Richard Larson, MD, PhD, the Health Sciences Center’s executive vice chancellor at the Health Sciences Center, and Christos Christodoulou, PhD, dean of the School of Engineering. Moving forward, the research team plans to complete a prototype over the next year and possibly file for a patent, Salas said.